Why Sales and Marketing Alignment is Crucial for Success! If your business is growing, you can no longer afford to ignore the misalignment between sales and marketing. We explain the reasons why you should consider merging both teams together. The purchasing process has changed. What used to work for sales teams is no longer effective, and a disjointed sales and marketing strategy benefits no one and leads to wasted resources. Sales and marketing alignment is a long-term strategy. Here, we share 8 steps you can take to get aligned, including our own unique case study on how we used it to increase revenue by 34%. 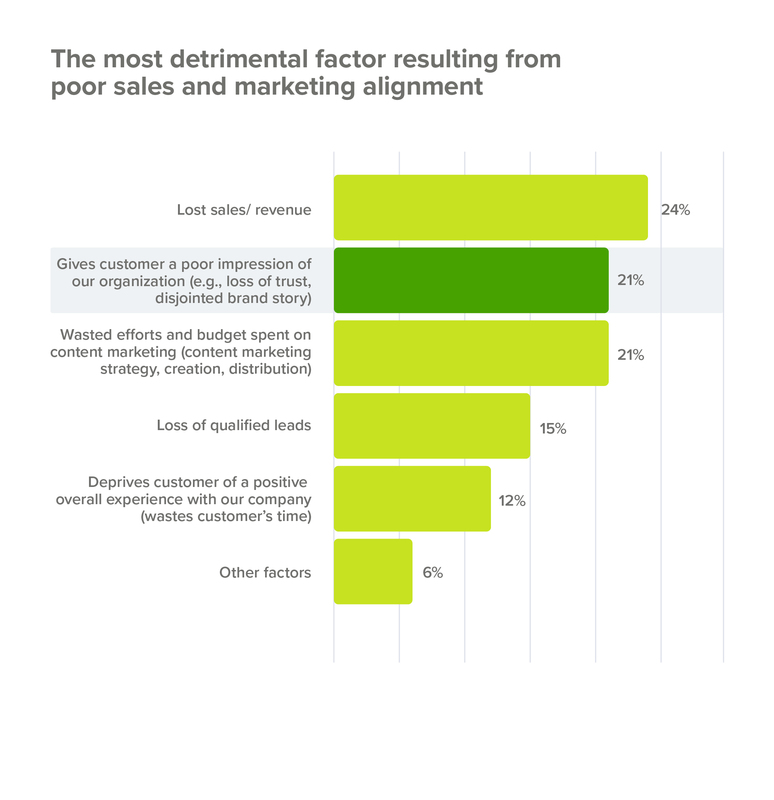 The lack of alignment between sales and marketing is failing businesses across the globe. So much so, that misalignment is costing businesses more than a trillion dollars per year. That’s right. Not $1 million or even $1 billion. But, $1 trillion (with 12 zeros). In fact, sales and marketing misalignment is the number one reason why an organization’s annual revenue stagnates or, worse, declines. 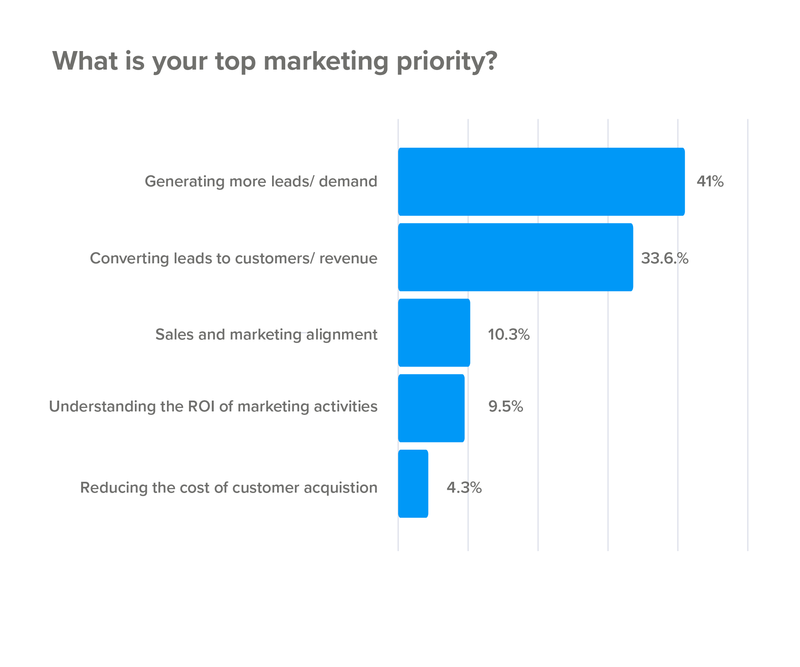 This issue has become such a hot topic that Software-as-a-Service (SaaS) companies with more than 200 employees have listed it as their third biggest marketing priority – ahead of understanding marketing ROI and reducing acquisition costs. Failure to align sales and marketing teams is leading to wasted budget and resources as up to 60-70% of B2B content is not being used and close to 75% of marketing leads never convert into a sale. If this sounds familiar, then now is the time to address the sales and marketing alignment challenge. Because if you don’t, your business is unlikely to grow any further. So, how do you successfully align both teams? Not just a blend of words between sales and marketing. “Smarketing” means that companies can have one single department, which works together seamlessly to close more business. Because sales and marketing are combined, rather than silo’ed, it becomes far easier to track results and make high-impact changes in a bid to increase your customer base. The research also found that high alignment generates higher brand awareness and average deal size. 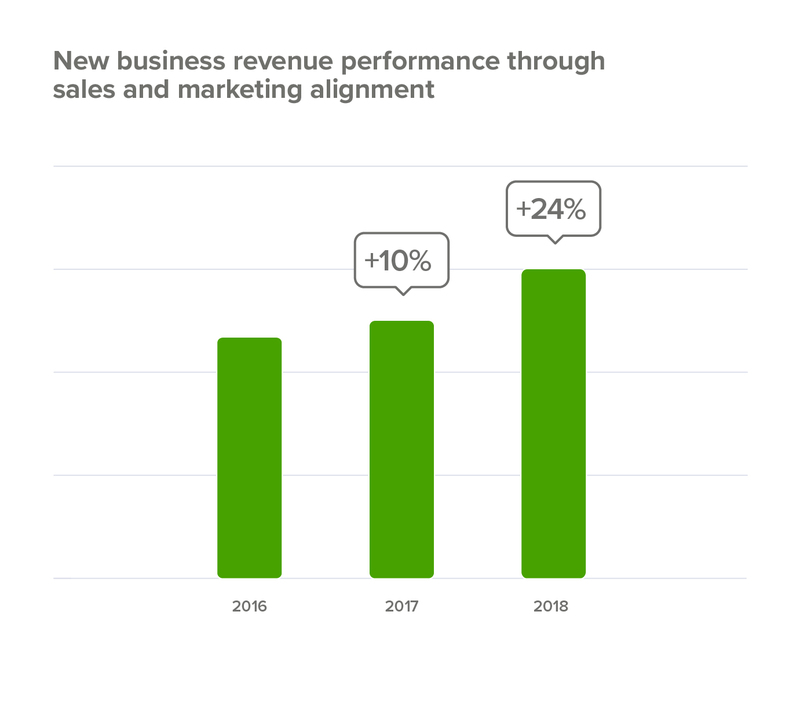 Furthermore, Sirius Decisions found that companies that align sales and marketing teams achieve 24% faster growth rates and 27% faster profit growth over a year period. In theory, it sounds great. But, does it work? In 2016, we began to align sales and marketing teams within our Dutch office – SuperOffice Benelux B.V – as new business growth had slowed down. Within two years, it’s played a critical role in helping us increase new business revenue by 34%! And it all started as we acknowledged the ever-changing roles of sales and marketing. Gone are the days of the “ABC – always be closing” approach to sales and using cold call “spray and pray” techniques to find new prospects. 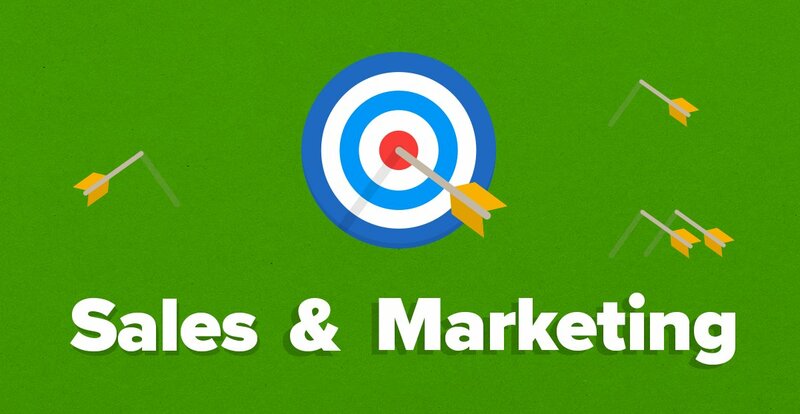 Today, sales is part of the wider marketing mix. 90% of buyers won’t take a cold call. In SaaS, the numbers are even more telling, with the average buyer not contacting (or wishing to be contacted by) vendors until they’re 57% through the sales process – which is set to rise to 80% by 2020. Anther reason is because the “funnel”, which represents the sales and marketing processes within a business, has also changed. Due to the introduction of sales automation tools and marketing software, you’re now able to collect a wide range of data on prospects – making the whole process more data driven. 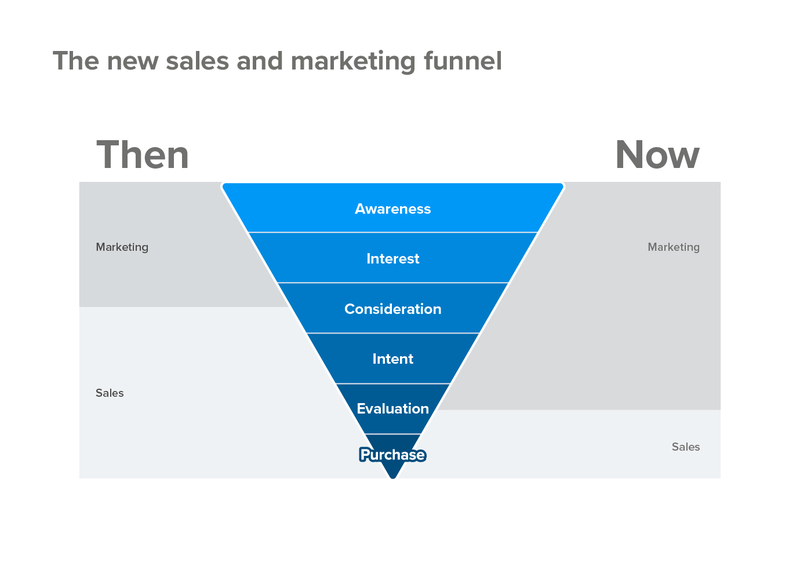 So, rather than a sales-driven funnel as it used to be, it’s now more of a marketing-driven funnel. Sales and marketing teams should go hand in hand as one department in order to attract, inform and retain customers. Aligning these two departments into a single “Smarketing” department plays a crucial role in the future of your business success. To help you on the path of aligning sales and marketing teams within your organization, we’ve outlined 8 steps you can take in order to improve the way that your company talks to, informs and deals with customers. When it comes to getting everybody in your sales and marketing department onto the same page, the best place to begin is by restructuring the entire customer journey. There should no longer be separate silo’ed experiences for your prospects. Instead, you should aim for one single brand customer experience. Starting from the awareness stage at the top of the customer journey’s funnel, right down through to the brand loyalty stage – everything should be tied together as an experience. Such connectivity will allow you and your team to track a prospect across the entire funnel. The top business challenge for companies that try to create a single customer experience is getting a holistic view of the customer. And this is where technology comes in. 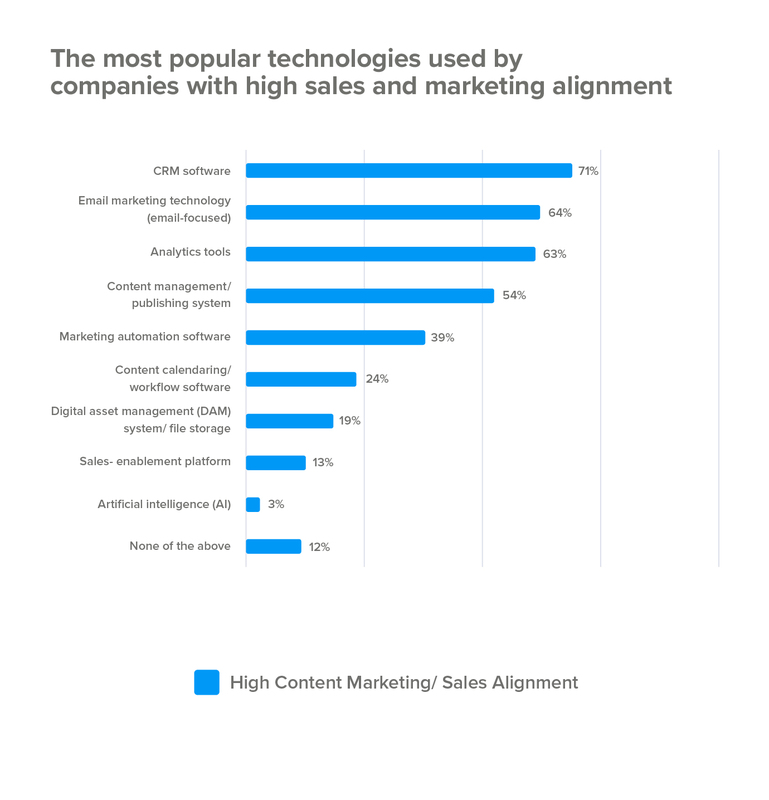 The most effective technology used by companies with high sales and marketing alignment is CRM, followed by email marketing, analytics, and marketing automation. CRM software provides you with a 360-degree view of a customer, and having that single view enables teams to act quickly and decisively to deliver more value to prospects at every stage of their journey. Putting the right systems and technologies in place will help you draw the bridge between the marketing data being gathered about a prospect and their transformation into leads and sales opportunities. When it comes to sales and marketing, knowing who you want to sell your product or service to is critical. Not clarifying who the ideal customer is can often lead to ineffective strategies and a disconnect between your teams. Sales may think that they want to go after anyone with money, whereas marketing might have a more targeted and systematic approach to their ideal customer. To get everyone on the same page and be more effective as a joint team, you need to help sales and marketing agree on a customer profile – by creating an ideal customer persona document together. This document will help you understand the type of customer you should be doing business with, based on factors such as company size, experience and industry. Collaboration between sales and marketing will help you understand who your ideal customers are, what they are looking for and what their biggest challenges are. If you don’t understand their challenges, then you will fail to understand their needs – and this is one of the most common reasons why companies fail to onboard and acquire potential customers. The ideal customer persona should be a living, breathing document that is shared and talked about by both the sales and marketing teams. To create it, you can simply use a tool like Google Docs or SuperOffice Project. This way, you can have a live and always up-to-date version readily available for the whole team to access whenever they need it. When your sales and marketing are misaligned, everyone plays their own tune: marketing will create a campaign targeting one group of customers, whereas the sales team will cold call or email (providing they have a legitimate interest) a different group of customers. Prospects are less likely to respond positively to cold calls or sales emails, if they’ve never heard of you, and this can negatively impact your reputation and your chances of closing the deal later on. What successful sales and marketing teams do differently is that they take a “marketing first” approach. This means that marketers find (or target) potential customers who have a specific problem and show them how it can be solved. It starts with marketing who warm up and nurture new leads by sharing information on the product and selling the features and the benefits. Then, when the lead is fully informed and ready to make a decision, the sales team can step in to reinforce what the marketing team have said and close the deal. 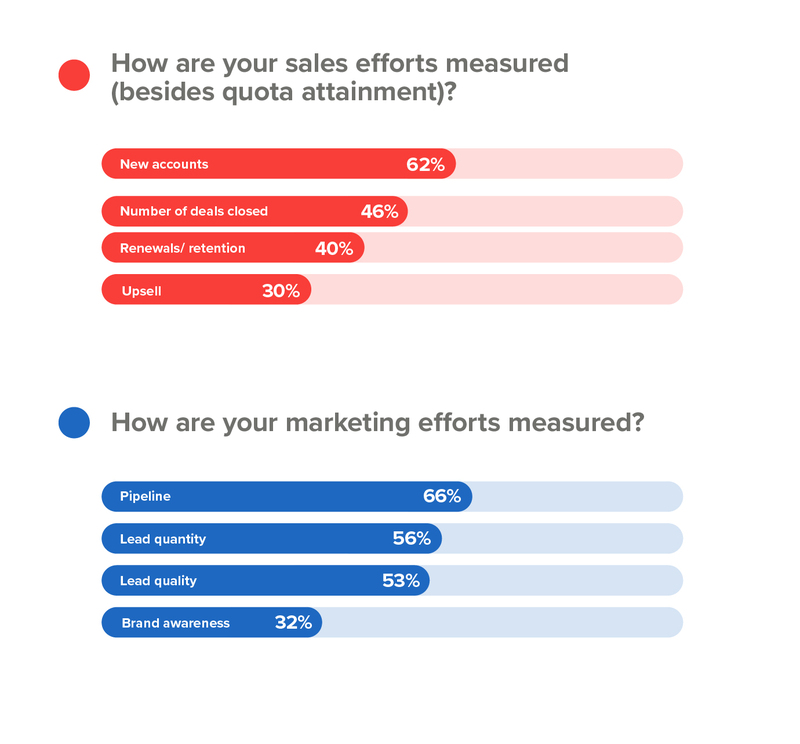 One of the biggest challenges in aligning sales and marketing teams is that both teams are measured differently. Sales teams are usually measured on numbers – be it new accounts, deals closed or contract renewals. Meanwhile, marketing teams are measured by lead quantity, quality and brand awareness. Is it any wonder that the teams are not aligned? When it comes to getting your sales and marketing departments in sync, the one thing you should consider is measuring joint key performance indicators (KPIs). By doing this, your team is uniting under one common goal. If your sales and marketing teams have joint KPIs, you get a great chance to see the synergy behind their work and analyze how your business is doing in both sales and marketing. Also, you will be able to detect the weak areas in your customer acquisition funnel, and fix not just parts of it, but the entire funnel. Make sure you schedule frequent meetings between marketing and sales, during which the marketers and salespeople can actively collaborate and agree on shared metrics to measure their performance – ideally, revenue growth. One of the most powerful things that you can do after you align both your sales and marketing teams together is to look at the feedback you get directly from your customer – also known as Voice of Customer (VOC) data. The best time to gather VOC feedback is during sales calls, which are a perfect opportunity for sales reps to discover potential customers’ pain points and motivations to purchase your products or services. You can then use these insights to pick out specific phrases to create new marketing messages, as well as refine your product or service offering. At the same time, you can use this information to get a better understanding of what your customers really like about your product. At SuperOffice, our sales teams surveyed more than 800 prospects to find out what they wanted to achieve with CRM software. The overall response was to “increase sales and improve customer loyalty”. Based on this feedback, we updated the copy on our home page to say just that: “Increase sales, improve customer loyalty”. As a result, the number of free trial sign up requests has doubled! You’ve experienced it before – the sales team calls a product one thing, but the marketing team refers to it as something else on the website. This is confusing for potential customers and is a good example of mismatched messaging. If sales and marketing are not aligned, then you’re not giving a good first impression of your company and, therefore, a prospect is less likely to trust you. In fact, 21% of B2B marketers cite “giving the customer a poor impression of our organization” as one of the most detrimental factors resulting from poor content marketing and sales alignment. That’s why, one of the biggest benefits of an aligned sales and marketing team is consistent messaging. By aligning both teams, your marketing messages can now warm up the prospects ready for the sales team who will reinforce those same messages and use them to close the deal. If the marketing messages resonate, the sales team can specifically act on them to close more deals. If you don’t do this, you run the risk of ending up with a fractured message – which can lead to a very uncomfortable and inconsistent journey for your potential customer. If your prospects think they’re getting one thing based on what marketing say versus being sold something entirely different by the sales team – it’s going to impact on your results. So, it’s important to make sure that you have a consistent and matched message across your entire customer journey. One of the most popular B2B marketing strategies used today is content marketing. In fact, more than 90% of marketers use it as part of their overall digital marketing strategy. When used by both sales and marketing teams, content marketing is highly effective at nurturing prospects through the different stages of the sales funnel. Unfortunately, two out of three sales reps do not know what content to send to prospects – meaning that the content you create is probably going to waste. 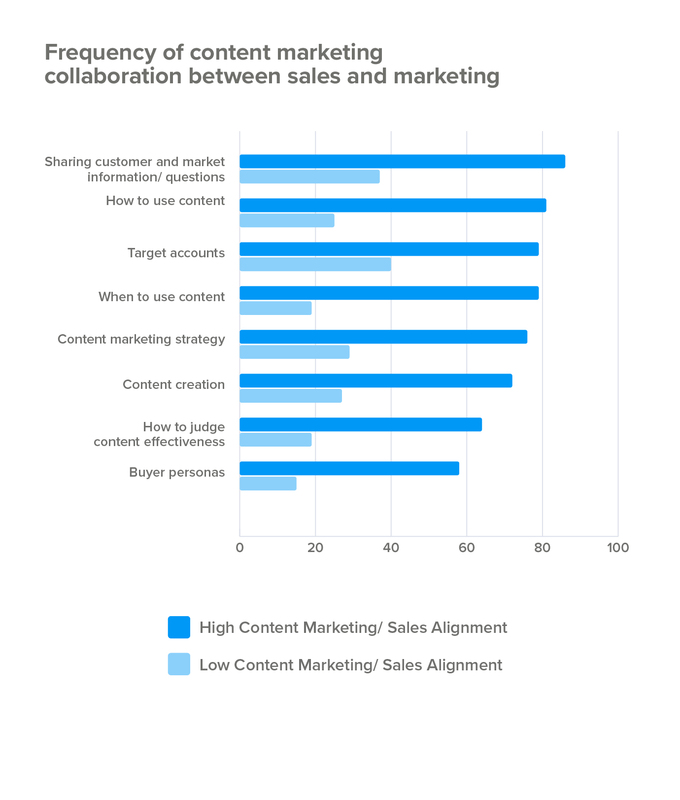 Unsurprisingly, the biggest difference between aligned sales and marketing teams, compared to misaligned teams, is that in high alignment organizations sales teams know exactly how they should use the content. When sales and marketing teams are aligned, content is used far more strategically – rather than being shared sporadically and without reason. By creating content assets such as product sheets, white papers or benchmark reports that sales teams can use to move prospects down the funnel, marketing can continue to create content that pushes a customer from one stage to the next in the sales process. Aside from hosting regular meetings between sales and marketing to discuss new content, another way to help educate sales teams on how to use content is to allow salespeople to guide new content development by contributing their ideas. There’s no easier way to get sales buy-in to new content than having them come up with ideas on their own! Combining your sales and marketing teams will help attract new leads and convert them into new customers. But, there’s a lot more to gain from this alignment, especially if the teams work together in order to grow and retain customers. Attracting new customers is up to 6-7 times more expensive than retaining them. By only focusing on new customer sign-ups, you could be missing on profits you should be making from existing customers. Therefore, sales and marketing should be working closely together in order to increase the lifetime value of your customers. For example, once you’ve acquired a new customer, your marketing team should shift their communication from attracting to growing and influencing a customer to stay with your business, try new products, upgrade their product, add more licenses, etc. – with your sales team ready to step in at anytime. 2016 was an important year. Sales reps were unhappy with the quality of sales-ready leads that were coming in, while marketing was tired of the excuses from sales for lack of follow up with the leads we had. It was a lose-lose situation, and something had to change. Fortunately for us, our Dutch team, led by Gert-Jan Doormalen, took the initiative and instead of the battle of Sales VS Marketing, they positioned it as Sales ❤️ Marketing – and thus, the theme “Marketing as a shared responsibility” was born. The initial focus was on brand awareness and social selling. 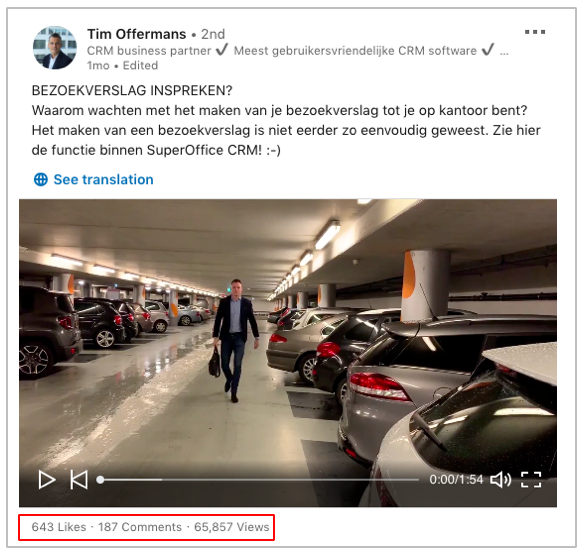 In came social selling expert Jan Willem Alphenaar to teach us about how to use social media for sales, and then we created a plan to share, engage and be more active on social media – in a bid to capture more B2B sales. Sales and marketing became much more aligned and now hold frequent meetings to discuss content, campaigns, digital activities and goals – such as what to post online and how often, how to target prospects and build relationships and how to engage with potential customers – all the while letting the world see who we are as people, as a brand and sharing our culture of CRM and a smile. We have a shared responsibility and with it, we get to share the success. This is a long-term strategy, but we’re already seeing some fantastic results! On LinkedIn specifically, a video we shared with our network generated more than 65,000 times! Best of all, we’ve seen an increase in new business revenue. Within the first 12 months, revenue increased by 10% and by the end of 2018, we’re expecting to increase revenue by a further 24%! How’s that for a reason to align sales and marketing teams? Aligning your sales and marketing team is a fantastic way to grow your business and scale it beyond what a separate sales and marketing team is capable of. By moving sales and marketing into a single “Smarketing” department, you’ll be able to uncover unique insights into the sales process, fine-tune and optimize your sales and marketing strategies, as well as grow new business opportunities and increase revenues. A fully aligned, hybrid sales and marketing team puts your organization in the best position to extract the most value from prospects and customers and, make sure that you are growing your business to brand new heights. 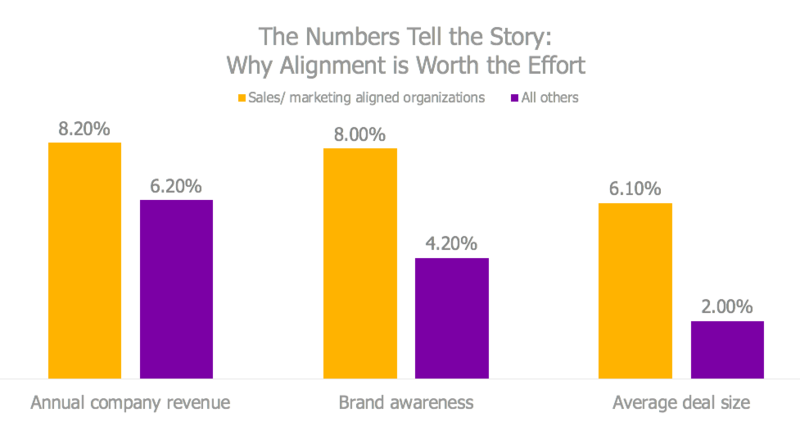 Are your sales and marketing teams aligned? If so, how has your business benefits from it? Let us know in the comment sections below. P.S. Did you enjoy this post? Tweet about it here. The most popular technology used by companies with high sales and marketing alignment is CRM. Sign up to a free, personalized demo of SuperOffice CRM and we’ll show you how to bridge sales and marketing teams through our award-winning CRM software.